Sending Leanne and Ben massive congratulations on their beautiful wedding at The Lawn, Rochford, Essex. The happy couple decided to have a wedding cake very similar to our “Bella” design but with the sugar lace covering the top two tiers and part of the 3rd tier, which replicated Leanne’s wedding dress. I added some edible sugar pearls and sequins to the lace and also finished the cake off with some diamante trim, for even more sparkle! 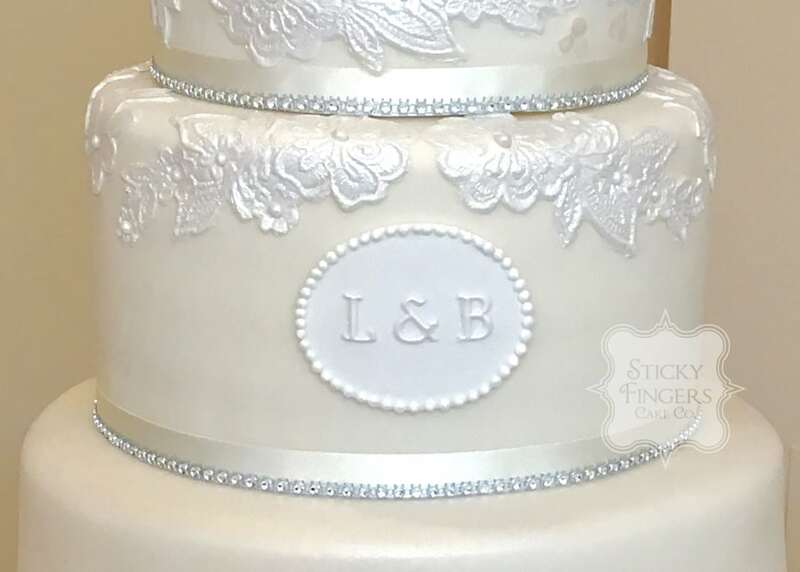 They also had their initials on the top tier to personalise it and a “C” for Charlie on the back in reference to their little boy, such a lovely idea! The flavours were traditional fruitcake, lovely lemony lemon cake, black forest and finally red velvet. Wishing you all the best for your future together!